The Bernina Express is consistently found in lists of the most scenic train journeys around the world. The Bernina line runs from Italy to Switzerland (or vice versa) starting/ending in the Italian town of Tirano and starting/ending in the Swiss town of Chur. It passes through some of the most picturesque scenery in Switzerland and is available for travel in both winter and summer. A train ride through the Swiss Alps is beautiful at any time of year. 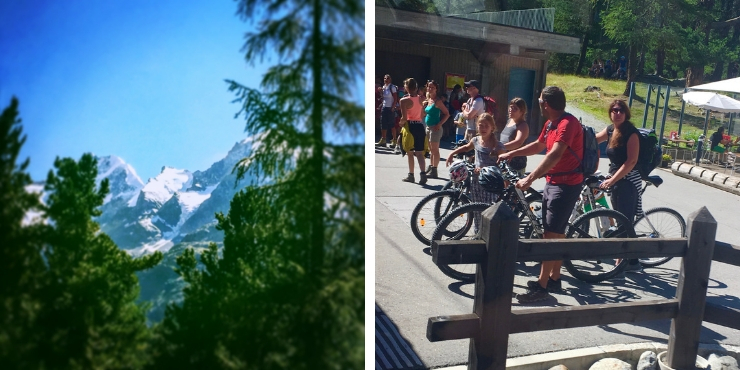 We took the trip north in summer from Tirano as we were traveling to Zurich. The Bernina Express is my preferred choice of train from Italy to Zurich and a highly recommended trip. What is the Benina Express? What is the route of the Bernina Express? 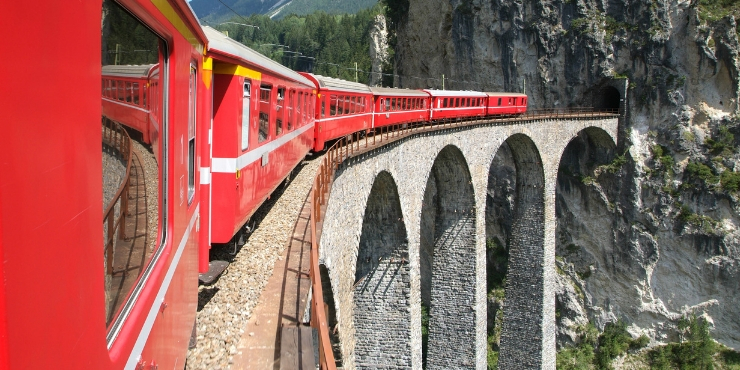 What is the Bernina Express? 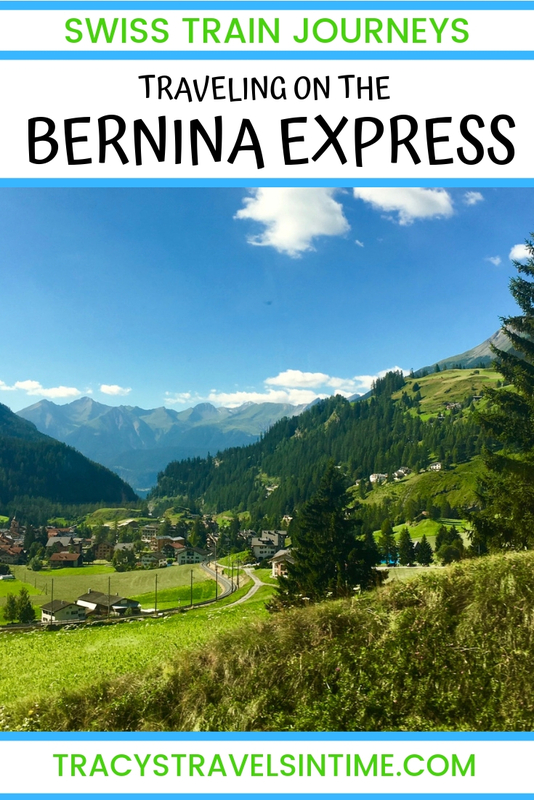 The Benrina Express is a 4 hour scenic train journey running both directions between Tirano in Italy and Chur in Switzerland. 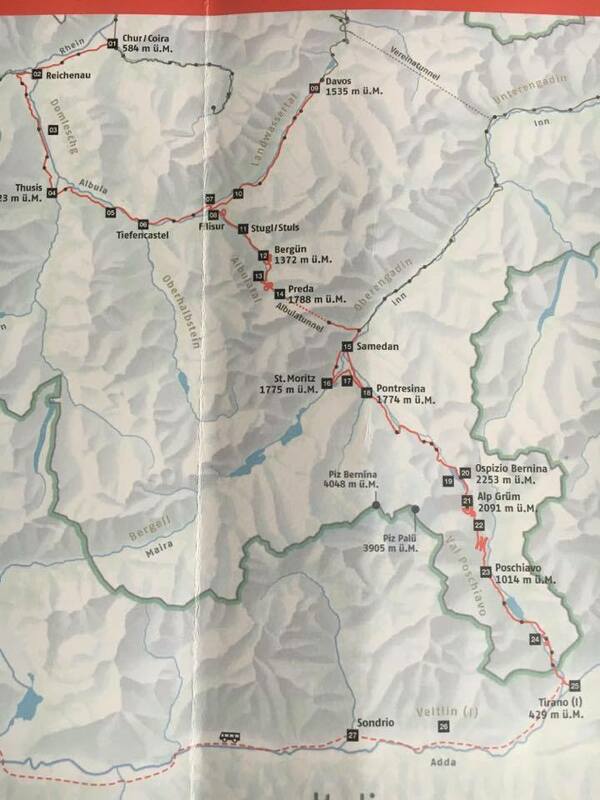 The route covers 144 km and includes 55 tunnels and 196 bridges. At the highest point the train is at 7392 feet above sea level. 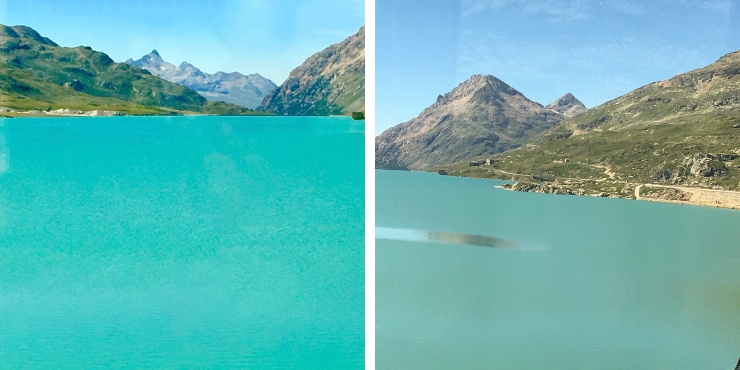 The train line is also used by standard regional trains but only the Bernina Express has the panoramic windows to enable you to fully appreciate the views! The railway was built between 1896 and 1904 and is operated by the Rhaetian Railway. 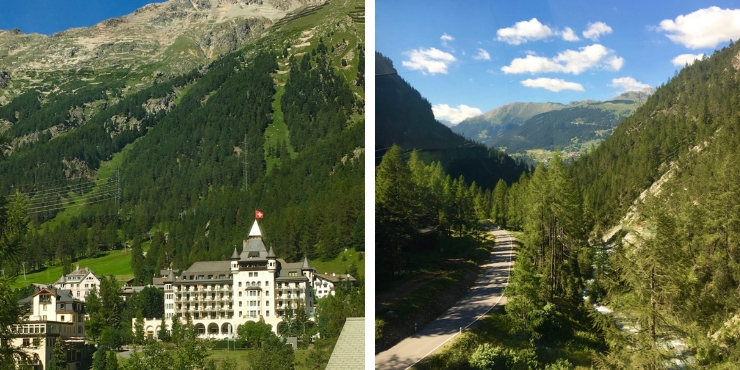 The route was declared a UNESCO World Heritage Site in 2008 – the Rhaetian Railway in the Albula / Bernina Landscapes. Part of the route of the Bernina Express is also shared with the equally famous Swiss scenic train the Glacier Express. 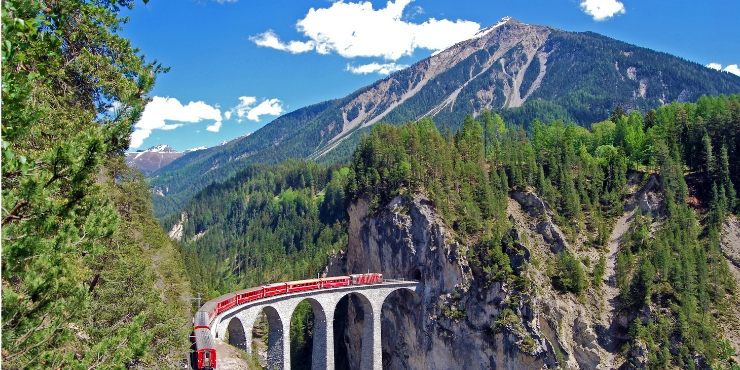 What is the Bernina Express route? As we started in Tirano I will describe the route from there to Chur. Handily there are free guides available on the train too so you can follow your route and identify where you are along the way. Once you leave the station the train climbs up the Tirano Valley passing Lake Poschiavo. After climbing the mountains for some time you arrive at Alp Grüm which is 2091 meters above sea level. Check out the views of the Palu Glacier. Continuing its ascent up the mountains look out for the Lago Blanco (white lake) just after the train passes through the station at Ospizio Bernina the highest point of the route! Admire the beautiful Alpine scenery. There were many cyclists and hikers at the various stops enjoying the warm summer sunshine. The train passes near to the popular Swiss resort of St Moritz. Before crossing the Landwasser Viaduct the train passes through the Albula tunnel at 1789 m before descending via several loops at Filisur. Just after Filisur the train travels over the viaduct. This famous sight had everyone scrambling for their cameras. The Lanwasser Viaduct is certainly an amazing feat of engineering. Where can I purchase tickets for the Bernina Express? 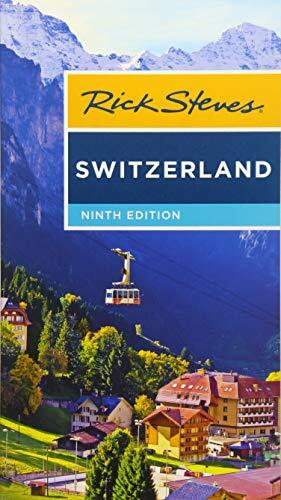 If you have a Swiss Travel Pass, or InterRail/Eurail Pass covering Switzerland you only have to pay the Bernina Express reservation fee. However make sure you reserve in the class corresponding to your pass. 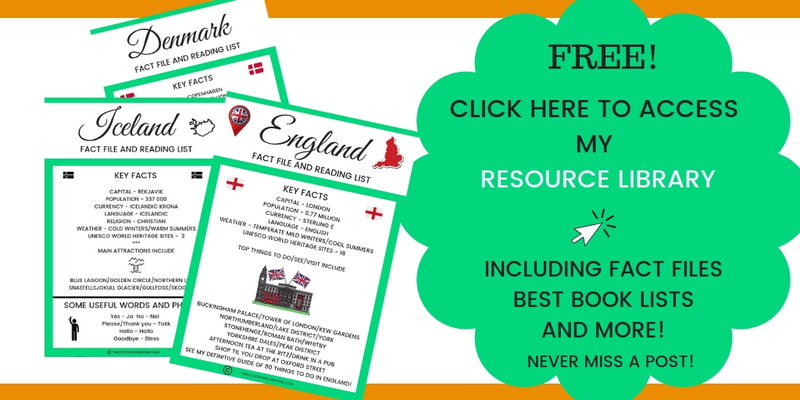 The most comprehensive site I can recommend for booking tickets is The Man at Seat 61 who details every possible configuration and cost as well as links and excellent tips. How can I catch the Bernina Express from Milan Italy? Make sure you validate your train tickets before you board the train if you purchase them on the day. If you pre-purchased and printed your tickets at home these do not need validating. The journey to Tirano takes about 2 1/2 hours and is a beautiful trip including some lovely views of Lake Como. The Bernina train leaves from a different station (the Rhatische Bahn) than the one you arrive at from Tirano but it is just next door and easy to locate. Walk out and look left and you will see the station for the Bernina service. If you arrive in Tirano for a few hours to spare there are restaurants and shops to look around. We had a lovely lunch at the Margy Bar which we highly recommend! 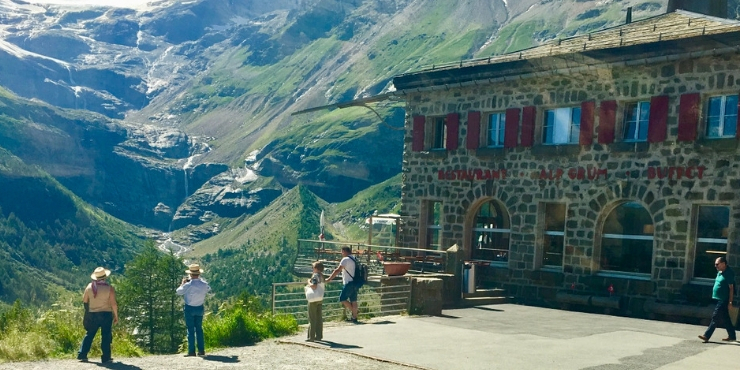 Which is the best side of the Bernina Express train to sit on? We sat on the right-hand side of the train going north which is apparently not the side to be on. However it is impossible to tell when booking your seat reservation which way round the carriage will be. We found that although the train was full leaving Tirano people did alight at the various stations and we eventually had both sides of the carriage free so were able to move from one side to the other. Officially the best views are on the left if you are heading north and on the right if you are heading south. I would highly recommend when reserving your seats you are very clear where you are sitting. We had a very unpleasant experience with a Dutch gentleman who insisted my niece’s window seat was his. He even assaulted her in the process of trying to remove her from the seat. It was only when I was able to show our reservations with our window sea reservations clearly shown that he accepted his own seat and sat down. Luckily there were 2 free seats further down the train and he moved on but it was a very unpleasant experience for both my niece and myself. If you would prefer to have 2 seats (facing each other) and not the 4/4 seat configuration this is only available in the 1st class carriages. We travelled 2nd class and found it perfectly comfortable (once the unpleasant man had moved anyway). What services are available on the train? There is a refreshment trolley selling prosecco, tea, coffee, various snacks and souvenirs. It comes through the carriage offering an at-seat service. 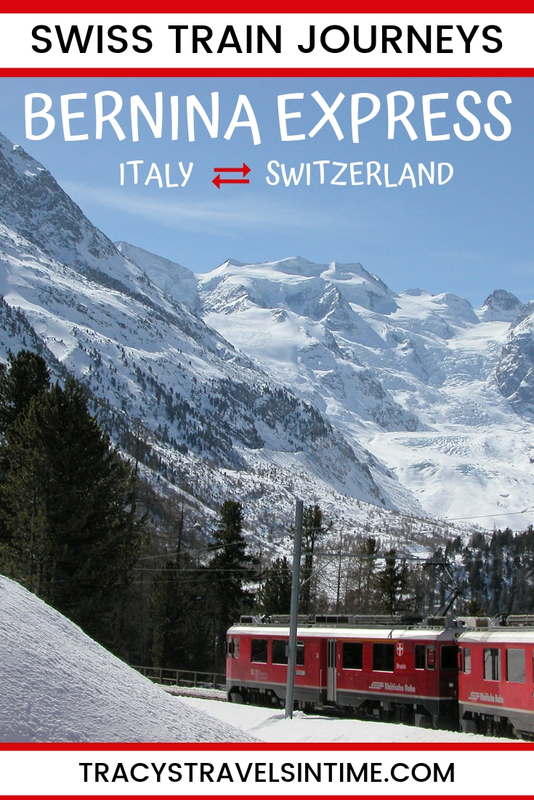 Should I take the Bernina Express in winter or summer? If you have a choice I would recommend doing it at both times of year! In winter the frozen lakes and snow-covered mountains will be incredibly beautiful whilst in spring/summer the green fields and flower filled alpine meadows will be a joy. The only tip I would say is that in winter it gets dark early so book an early train to ensure you see everything. If you are heading to Tirano from Milan I would highly recommend staying at a hotel near to Milan train station. 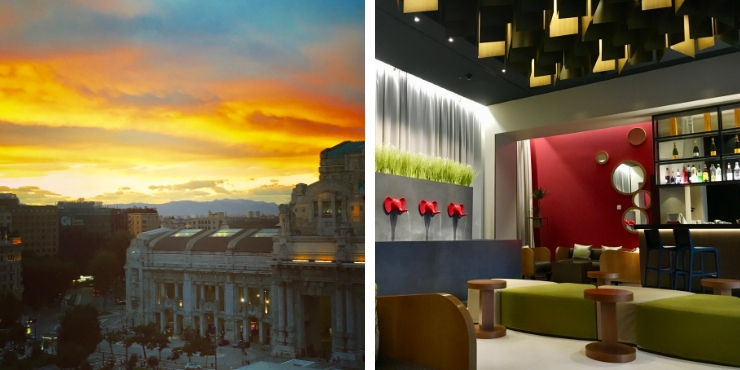 We stayed at the Glam Hotel when we were in Milan (after traveling from Venice and Verona) and this provided easy access to the train station for our ongoing travel. The Hotel Glam Milano a 4 star property with modern rooms, air conditioning and free WiFi as well as a fantastic view of Milan train station. 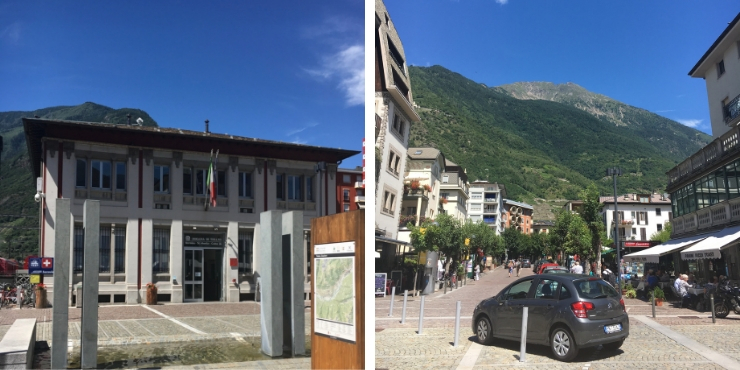 Although we caught the train from Tirano the same afternoon it is possible to stay in Tirano and enjoy Italian hospitality for one more evening! I would highly recommend booking seats on the Bernina Express. It is certainly one of the most scenic train journeys I have taken with Alpine meadows, the Swiss Alps, lakes, quaint Swiss towns and villages, viaducts, valleys and more to keep you enthralled throughout the trip. I would love to take the trip in winter to see the mountains and valleys deep in snow. 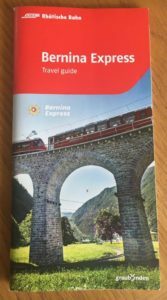 If you are taking the Bernina Express train from Italy to Switzerland or vice versa please ask any questions or leave comments below. 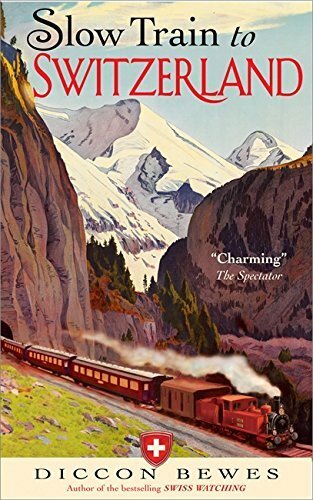 If you are considering a trip around Switzerland by train definitely include this trip – for other ideas check out Janet’s post – A Grand Train Tour of Switzerland. Drive – on the right! PIN – please share and pin to your pinterest account! This looks right up my street – I’ve just decided I’m a big fan of scenic train travel having taken the Amtrak train from Chicago – Seattle. It was a fantastic way to travel and I’m now looking out for others I can add to my wishlist. This is going straight on it! I particularly like the helpful map and the prosecco, of course. Pinned! We really want to do the Chicago- Seattle train!! We did Seattle – San Francisco – LA last year and loved it. 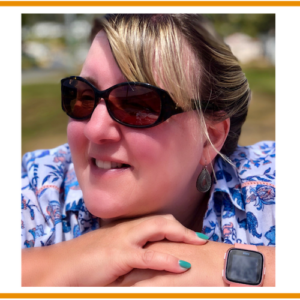 I love train travel – it is always my preferred transportation option! There is a post coming soon on a trip up Mt Pilatus in Switzerland – that involved train, boat, cog railway, cable car and then bus! It was amazing! That looks like such a fabulous journey! I love train travels and I bet this particular journey would be even more stunning during winter when there’s tons of snow around, right?! Hi yes it would be amazing in winter too! 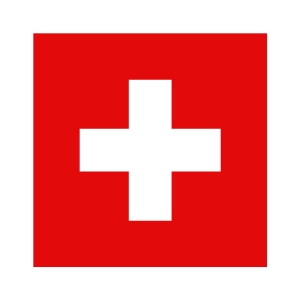 My Mum lives in Switzerland so I get to travel there quite often – I may do the journey over winter so will share pictures if I do! This looks like an amazing trip! The views are just stunning and there is nothing better than train travel, in my opinion 🙂 I would love to see more of Switzerland as from what I’ve seen so far, it’s too beautiful! Hi it was a lovely train journey through a very scenic part of Switzerland. If you get the chance the Geneva to Zurich route is lovely too as is the Zurich to Milan! 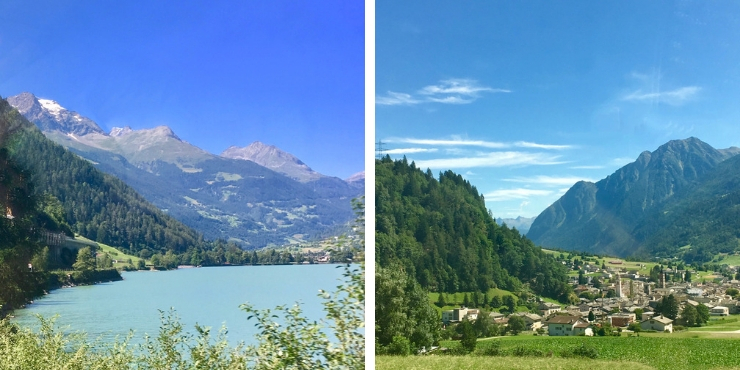 I have another post on my blog about a train journey to The Top of Europe which is a designated World Heritage Site and the views are stunning. I am also writing up a post following our trip up Mt Pilatus just outside Lucerne so that will be worth looking out for. Thank you for stopping by and the lovely comment! 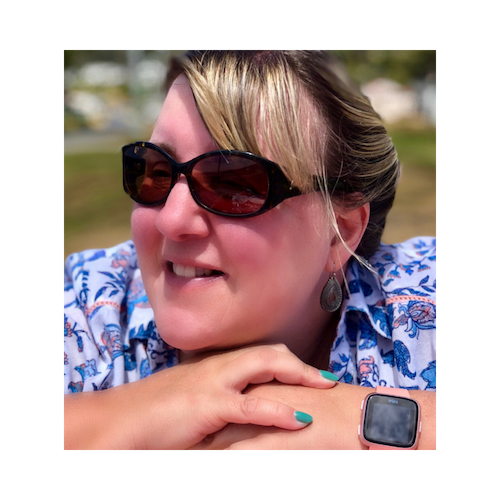 Hi Lauren – travelling by train is my favourite was to get about. I am not a great fan of flying so if I can I take a train. I love scenic train journeys and this is just one of a few I managed this year. I haven’t been to South America though and its such a pity it was dark on your train trip! I bet Machu Picchu was amazing though! Thanks for stopping by! The scenery looks lovely. I like the wrap around windows on the train. It was really pretty – the windows certainly help you to appreciate the views! Its a lovely trip isn’t it? We did the reverse Chur to Tirano last year (during winter to see the snow, but there wasn’t any). We really enjoyed train travel and did a lot throughout Switzerland, Germany, Austria, Slovenia and much more. Definitely the way to do it. 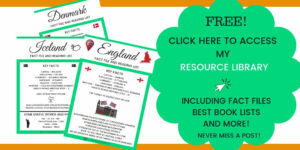 It is without doubt my favourite way to travel – we travelled Italy, Switzerland and then from Croatia to Slovenia and onto Switzerland (my Mum lives there so we ended both trips with her) – its so easy and a great way to see Europe! What a spectacular train ride! I’m adding it to my list, for sure. And I’ll second the recommendation for seat61, it really is the go to source for all things train travel. Thanks for linking up with #wkendtravelinspiration! Thanks Jim its a great route to take – stunning scenery all the way! 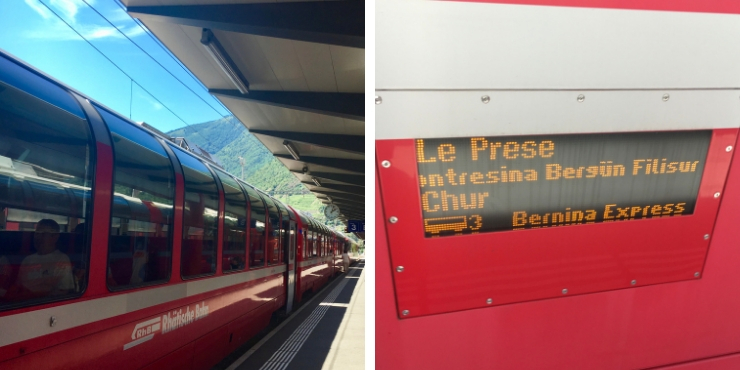 Trains are so much better aren’t they – hope you get the Bernina Express some time its a fab train! Yes do check out his site – for anywhere in the world for train travel – his is the go-to site! Europe is amazing to visit by train! So beautiful and the trains are excellent too! These photos are stunning! Doesn’t matter you used your phone and through the glass. The scenery is just spectacular! I can’t believe how many tunnels and bridges you went through and over. I would love to take that train journey! How much were the tickets? Thank-you Kreete. My niece had a railpass and she only had to pay for the reservation – it isn’t as expensive as you may imagine. The railcard was very much worth it! Yes, I had the same trip…but I started from Venice. Every corner is picturesque. We loved it . Great trip isn’t it! We had travelled from Rome up to Venice then Milan before linking up with the train! Tracy, before I found your site, we made reservations a couple months ago to ride this train. We spent a couple days in Milan, and now we are staying in Varenna for the rest of our 2week vacation.. My wife and I are leaving Varenna on Monday, May 28 by train to Tirano, then on the Bernina Express to St. Moritz. We will stay overnight and head back to Varenna. We decided to catch a train back to Milan the day before we leave to minimize our transportation risk to Malpensa airport the next morning. So, we are also staying 1 night at the Glam Hotel. It is great to find your site and feel more comfortable, as a pioneer has forged a path ahead of us. I will give your my feedback after the trip. Your trip is very wonderful. I plan my trip by Bernina Express from Chur to Tirano. Which side of seat should I booking ? either right view or left view? which one is beautiful view? I hope can get your advise. Hi Phelix if you are travelling on your own or with someone else I would book the tables for two which are one one side of the aisle. If you are heading south the best views are on the right of the train and going north on the left hand side. It is impossible to tell when you book seats which way the carriages will be but you could always move seats once on the train if there are free seats.